Every year I get velvet ant nests in my yard. We have digger bees or wasps and don’t mind them since they fly and seem to avoid the dog. But the velvet ants are all over and my dog keeps getting stung when he steps on them. Velvet ant on the prowl. 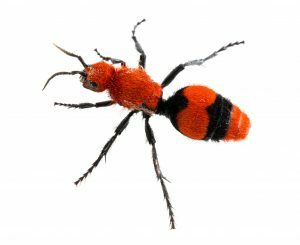 Velvet ants are actually a wingless wasp but has a very painful sting. Velvet ants pack a painful sting and though typically not aggressive, they will react if you step on one! Interestingly, velvet ants are actually a wasp. What makes them even more interesting is that they survive by targeting ground nests made by other insects and seem to prefer digger wasps or digger bees. Based on the fact that you’re allowing these other wasps to live in the yard, it sounds like you might be naturally attracting them to the area. Once a foraging velvet ant finds a nest, it will move in a “take over” by stinging and controlling the adults and stealing their food. Females will then lay eggs on the host nest owner which in turn converts the nest to a velvet ant colony. So if you have 10-20 digger wasp nests in the yard, you could end up with just as many velvet ant nests too. And this problem will do nothing but get worse from year to year which it sounds like has been happening in your yard. To end the activity immediately, dust all the holes you can find with DRIONE DUST. This fast working dust will both kill developing stages of ground nesting bees or wasps including the velvet ant. It will also absorb and essentially “remove” the scent and smell left by all of these insects which will stop new activity. 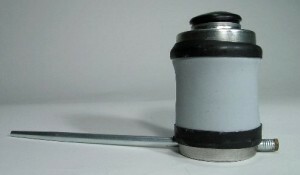 The small Drione will be enough for 25-50 nests and it only takes2-3 squirts of dust per hole. 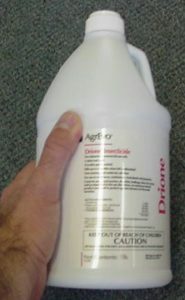 Drione works by “dehydrating” insects and will kill target pests in a few minutes. In the ground, Drione will last several months so when eggs hatch, it will kill them too. Use a HAND DUSTER to apply the Drione; it will only take 3-5 seconds to treat each hole so even if you have a lot of nests, the process is fast and easy. To ensure they don’t come back next year, treat the entire yard (or least the area you want to keep velvet ant free) with DEMAND GRANULES. Do this in mid spring, as soon as you find insects foraging about in the yard. Demand will slowly release into the soil and is highly repellent to ground dwelling crawling pests like velvet ants. Treatments will keep them away for at least two months and in late spring early summer, this is the prime time for them to be building new nests. 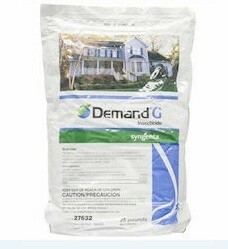 Use 3 lbs per 1,000 sq/ft of yard and renew every 60 days to ensure you have protection year round but in general, one application will do the job for the season.